Rubber car mats are excellent at catching and containing spillages, whether that be dirt or liquids. However, one of their most useful features can also be a drawback; ridges and grooves designed into the topside of the mat can trap these substances so well that they’re difficult to remove once dried. If you don’t clean your car mat regularly enough, then it can soon become even dirtier than the rest of your car and can even begin to smell. Picking up a brand-new rubber car mat is cheap and easy, though it's even cheaper and quicker to simply clean your existing mat. Unlike carpeted car mats, rubber car mats are far more durable, more easily cleaned, and liable to last much longer. Read on to see how you can clean your rubber mat in just a few simple steps. As a quick note, if your rubber car mats are dry and simply contain loose food debris, stones, or other non-stick detritus, then you can probably clean them up very quickly using a car vacuum. This is a good option if you don’t have much spare time. However, if your mats have stuck-on dirt or are wet, then you’ll want to start by carefully removing your soiled car mats from the vehicle, keeping them flat so that no dirt and debris can spill off the edges. Take extra care if your mats hold water or some other liquid. Once you're in a position in which you aren't worried about getting the floor dirty – outdoors, preferably – then shake all the excess dirt from your mats and slap the reverse of the mat to loosen any stuck-on dirt. Once you've removed all the loose dirt and debris, you can rinse your car mat with water straight from the tap. If your mats are simply dusty, then this will likely be enough to restore their former glory. However, for any ground-in dirt, you can use a hose to blast it off. That said, it's recommended that you don't pick the highest-pressure hose available, as weaker products could tear if placed under too much stress. 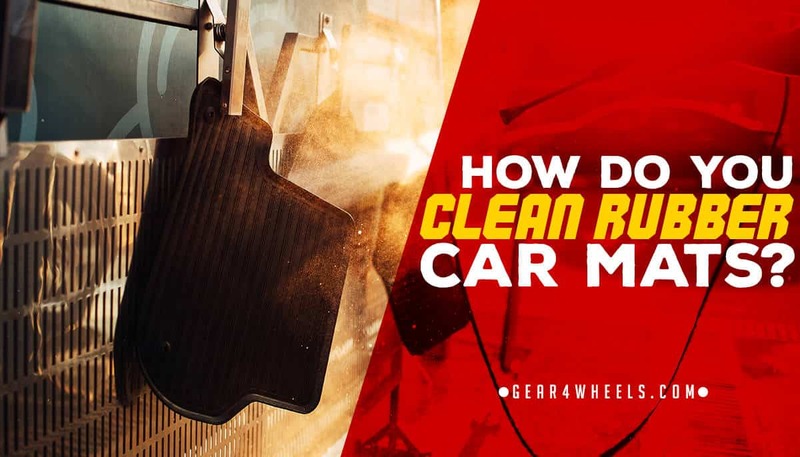 This is not necessarily an essential step, but it's worth doing if your car mats have been exposed to any chemical substances or those that may stain, for example, engine oil transferred from the sole of a shoe. You should opt for a cleaning solution designed for car interiors, gentle and safe, not to damage your rubber mats with harsh chemicals. You could also use a tire brush or similar accessory to help scrub away residue or any remaining dirt. Once you've finished, you can use the hose to blast your mat once more, ensuring that you remove any excess cleaning product. When it comes time to dry your rubber car mats, don't use the sun's rays. UV light can rapidly bleach the color from your car mats and could even cause them to develop fine cracks in the rubber. This will make them to degrade more quickly, as well as making them even more difficult to clean in future. The better option is to use a microfiber cloth or towel, or if preferred, you can place them in the shade to cool off and dry out slowly. Whatever you do, you shouldn’t introduce your rubber car mats back into the vehicle until they have completed dried out. Doing so could result in mold forming on the mat, or even transferring onto the carpeted interior of the vehicle, from which it can be very difficult to remove once set in. Furthermore, you could cause any metal parts inside the vehicle to rust. Rubber car mats are almost always easier to clean than carpeted alternatives. By following the above steps, you can quickly and easily clean any dirt from your car mats without having to replace them. On a final note, it’s worth mentioning that you should avoid using any sealant products that promise to repel water, such as silicone or vinyl protectants. These products can make the rubber more slippery than normal, which could lead to accidents while driving.